The present and future situation of Creamware Datentechnik, which builds Luna, Pulsar, Scope, and Noah (DSP audio/treatment cards), was in the balance since last June. But today news appeared on their website that should please the impressive 30,000 registered users concerned by the future of their products. Sonalksis has announced the release of the SV-315 stereo Compressor/Limiter, an analogue-modelled dynamics processor developed for professional audio applications. This plugin is available in Audio Unit and in VST format for mac OS 9 and Mac OS X. The RTAS support si coming soon. The Sonalksis SV-315 Compressor/Limiter is available on line for EUR 209.99. Sonalksis SV-315 Post a comment ? 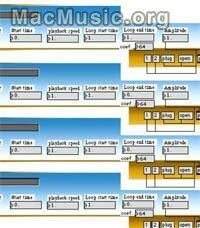 Interesting Freeware on Mac OS 9 for recording and copying audio and tempo-synced loops. A lot of interesting features: record, edit, and apply VST to loops. It's a useful application dedicated to exporting audio files to other apps. OUTI on MacMusic Software Post a comment ? At the NAMM 04, Tascam announced the release (expected April) of the US2400, a 24 track DAW controler. The US2400 should allow 192 channels and will be equipped with 25 touch-sensitive moving channel faders, 24 encoders (control pan, aux level or channel strip functions like EQ & Aux) and a joystick for the surround control. The US2400 is compatible with Mac OS X and should list for about US$2000. 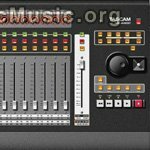 www.tascam.com/product_info.php?pid=342 Post a comment ? Universal Audio has announced that the new UAD-1 Studio Pak is now available. The pack now includes the UAD-1 PCI DSP card and a collection of 20 Universal Audio plug-ins including: the 1176LN/SE and Teletronix LA-2A vintage compressors, the Pultec EQP-1A, RealVerb Pro, Cambridge EQ, Dreamverb, Nigel guitar processor, Fairchild 670 compressor and the CS-1 Channel Strip. The CS-1 itself includes a collection of plug-ins developed specifically for the UAD-1, including EQ, compression, delay modulation, and reflection engine modules. 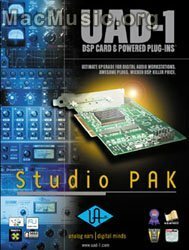 The UAD-1 Studio Pak supports VST, AU & MAS plug-in formats and is now available for a MSRP of US$1199. UAD 1 StudioPak Post a comment ?